2 Pythagoras Coin – We selected an Ancient Roman coin from 260 c.e. that was said to depict Pythagoras to act as our base image. It reflected many of the ideas we wanted to capture so we add only minor modifications. Pythagoras is a legend in Masonry. He appears in many important documents of Masonry as a forefather of masonry and a spreader of Geometry. Nowadays knowledge of Pythagoras is usually limited to knowing that he discovered the theorem that bears his name. We adopt him as our legendary hero and master builder and encourage people to study the Life of Pythagoras. Therein you will discover that he was the founder of a school that used a method of symbolic instruction. 3 Square The square represents Geometry, and is a tool of measurement and math. We also hold it as a symbol of the power of Pythagoras and as the measure of virtue it represents prudence. The square over the pillars globe also alludes to the concept of squaring one’s circle. Egyptian God Thoth (both who were said to be Gods of wisdom and conductors of the dead psychopomps). Many modern people erroneously use the Caduceus as a symbol for health mistaking it for Asclepius staff but is different and more powerful. The Caduceus was the equivalent of a magic wand. 5 Pillar The pillar, the 3rd on the coin represents the pillars that was once lost but now found. A reminder that nothing is ever lost. The pillar also represents our perfected mental nature which still requires adjustment by a builder. Science ever being progressive, the crafting of one’s pillar is also a progressive and individual experience that evolves over time. In this way it is a nod to the degree of Fellowcraft and what Wilmhurst called its purpose – the disciplining, mastering and control of one’s psyche. 6 Caduceus, Square, and Pillar Collectively this is another symbol for being master of two worlds, math and magic, science and spirituality in the development of one’s mental nature. 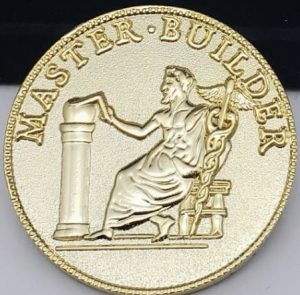 The square above the globe alludes to the metaphor of squaring one’s circle, an impossible task using just a compass and a straightedge, however, our builder uses a caduceus and a square. Thus he is able to ascend the rules of normal Euclidean space while still making use of it. Collectively the tools allude to the concept of man mastering the use of both natural and supernatural origins. We present as objects for further study. 7 M.A.S.T.E.R. The concept of Master forms part of the title of the 3rd degree. The Master in Master Builder alludes to the idea that Mastery is the result of expertise in both Knowledge and Experience. It is the point where one can communicate and use an idea effectively. The term Master as an acronym also refers to a special accelerated learning method, detailed in this article by Brother Graeme J. Beresford (http://www.themasonictrowel.com/education/memory_files/mastering_the_art_of_learning_ritual.htm). 8 Builder At a masons core he is a builder. It is the key element of our identity. We Build. They say you are what you do. Builders build. But we are to remember that what we build is what separates us from our operative brethren, for what they built in stone, wood and mortar we build in Brotherly love, Truth and Relief. We are reminded of this fact by the Middle Chamber. Thought”, was that it allowed one to quickly retrieve information in and out of order and also allowed for tremendous information to be stored as well. A monk was able to construct and access a library of knowledge on various subjects that would aid him in constructing his meditations and also helped him to make moral decisions. It is the common belief to many that the monks transmitted these practices to Masonry via Giordano Bruno and the art of memory. Personally, I believe it happened from a much earlier time and probably mixed with practices already existing in the craft. 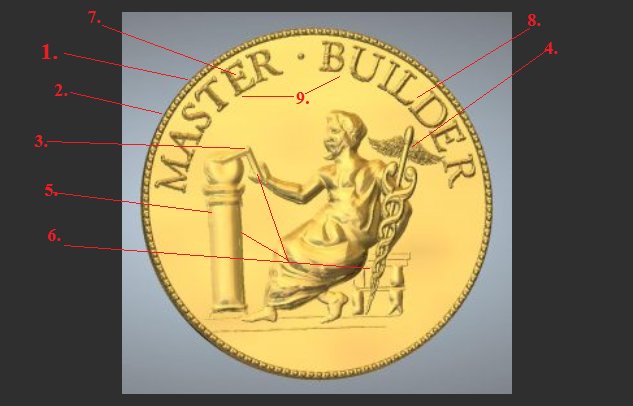 Either way, the Master Builder concept is a powerful tool and can be used to understand, memorize and apply Masonic symbolism to our daily lives. To that effect check out our Builder course here, a great way to better understand the symbolism of Masonry.